Dream ideas – those solutions that seem to be pie in the sky; perhaps impossible unless you just had tons of money and endless resources at your disposal. But for once, a product is available on the market that truly does let you dream up an idea, and then do it. If you haven’t guessed it already, it’s called Ignition by Inductive Automation. This isn’t just some marketing hype. Customers tell us daily how they are using Ignition to create innovative solutions to problems in the automation industry and beyond. Here is one example told to us by Christopher J. Babb, Electrical Engineering Manager for VVF Illinois Services, LLC. 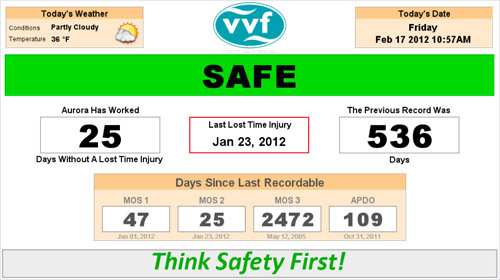 “At VVF we needed to find a better method of displaying safety Information to all plant employees. The requirements were that it had to be a digital sign that would display the current safety status and safety information for the plant. Also, the data entry method needed to be performed through spreadsheets, or something similar. “Our current method of displaying safety information to plant employees was a couple outdated signs. The first sign is old and the light bulbs that highlight the current safety status are expensive and prone to failure. The sign also requires daily intervention to display the correct numbers. VVF's new self-updated sign is an effective and innovative method that replaced the old signs that had to be manually changed on a daily basis. “The second sign is a whiteboard that contains department safety information and daily notes. This sign also requires daily intervention to update because the information has to be handwritten on the board. 1. We considered re-purposing some of our out-of-service computers to run a slide-show application on a large high-definition monitor. This was an unworkable solution because of the old computer’s display limitations and incompatibility issues with the video cards. 2. Another consideration was to purchase a new desktop or laptop computer to run existing slide-show software. This was also not workable due to the capabilities and limitations of the software application. 3. Our final option was to purchase an inexpensive, dedicated media center computer that would run digital signage software with live data update capabilities. We chose this method as it seemed to be the most workable at the time. “We spent several days looking for alternative sign display software and discovered that the entire digital signage industry was absolutely outrageous in terms of its offerings and especially the pricing structure of its products. 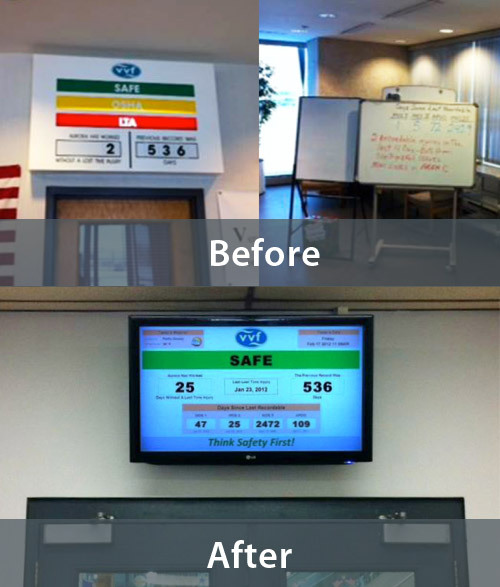 Ignition was the perfect solution to make a digital sign that displays safety information as well as date, time and weather. 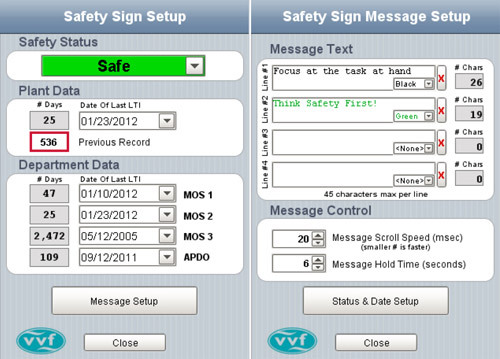 Ignition makes it easy to update the sign via a smartphone. “Using Ignition we were able to quickly put together an initial solution and presented it to our safety director. “This sign is running on a 42-inch high-definition commercial grade LED TV and replaces both the existing sign and whiteboard. Because Ignition is database driven, the information for the day counts is calculated automatically for each department through database queries, eliminating the need for someone to update the sign daily. Thanks to the wealth of information in the Ignition support forum and the built-in scripting language in Ignition, we added some other great features to the sign to make it even more dynamic. We added live weather data that is pulled in through the Yahoo Weather Site and we added a message box that allows for 4 different messages to smoothly scroll vertically at the bottom of the screen. We love to hear how folks are using Ignition's powerful features to creatively solve problems, both big and small. If you have a story about how Ignition has made your job easier, let us know. If you can dream it, you can do it with Ignition.